The National Weather Service is forecasting heavy rainfall in Southeast Texas that would peak on Friday night. 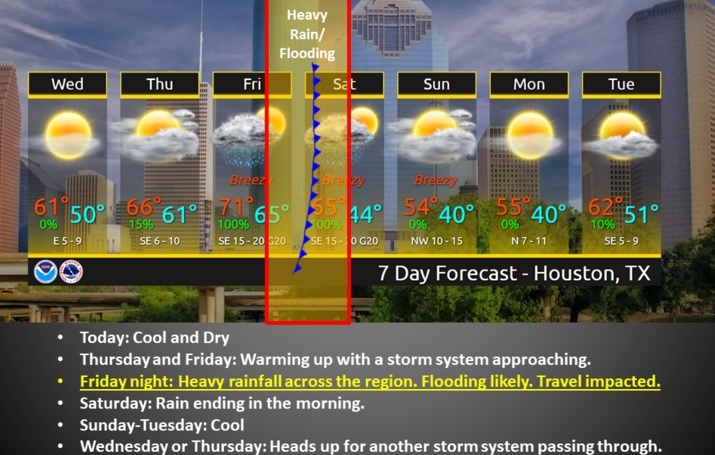 The City of Houston’s Public Works Department said there could be a pre-release of water to lower Lake Houston in anticipation of heavy rainfall forecast by the National Weather Service for Friday. The Public Works Department said property owners should secure property along the shoreline for a potential lowering of Lake Houston up to 18 inches before the end of Wednesday. The National Weather Service is forecasting heavy rainfall in Southeast Texas on Friday night due to a strong storm system that formed in the California coast on Tuesday morning. The NWS forecasts rain chances will increase starting Friday morning. Friday afternoon through Saturday morning is the period when the heaviest rainfall is expected peaking Friday night. A flash flood watch is likely to be in effect for that time period.